Med School’s Hard Enough. This Guy's Doing It With Cancer. 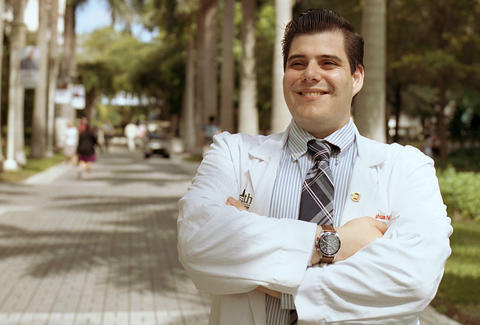 In July 2014, four days before he was scheduled to relocate from his hometown of Plainview, New York to Miami to attend his first year of medical school, Joshua Novy found out he had cancer. He was twenty-six years old. His car was packed. Inspired by his father, Novy steadily pursued a future in healthcare. 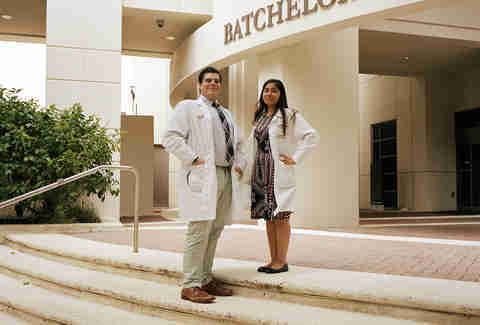 After his second year at Nassau community college, he transferred to Cornell and obtained a Master’s in Physiology at New York Medical College before receiving his hard-won acceptance into the Miller School of Medicine at the University of Miami. A school which, as a part of its matriculation process, required vaccination screenings. That summer, Novy took the vaccination request as an opportunity to see his doctor for a full physical exam. Blood tests during that exam showed signs indicating that he might’ve contracted, of all things, syphilis, although he was advised that further testing would likely reveal that result as a false positive, replacing it with an autoimmune disorder such as lupus. Given his unflagging medical curiosity and the knowledge he’d gained during his master’s program, Novy got ahold of the lab reports himself. When he saw his white blood count numbers, he demanded to see an oncologist. Based on his age and other contextual factors, his doctor insisted that lupus made more sense. At the time, his mother, Yvonne Novy-Cutler, a cheerfully sarcastic, British-born advocate for families with special needs children, says she tried to temper her son’s reaction. Novy was right. 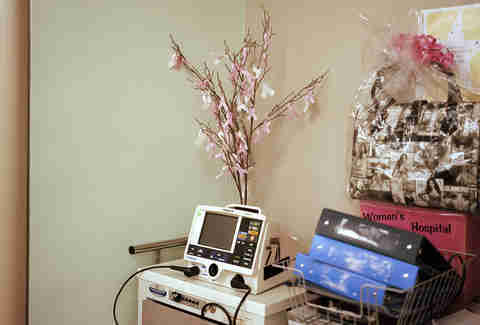 The next phone call he got was his oncologist requesting a bone marrow biopsy. A week later he was diagnosed with the early phase of Chronic Myeloid Leukemia, a white blood cell cancer that arises from an error in cell replication, essentially leading to the formation of a new, destructive chromosome known as the Philadelphia Chromosome, which spawns profound bone marrow complications. Over the course of the past decade, scientific breakthroughs had led to a new oral drug-based therapy with significantly reduced side effects as opposed to the former combination of invasive systemic chemotherapy and a bone marrow transplant. It was a breakthrough that led Novy’s oncologist to agree that he could potentially still attend medical school, while undergoing treatment at the university hospital. Having left his support system behind in New York, Novy was reluctant, based on the horror stories and urban legends he’d heard about the competitiveness of medical school, to alert anyone in his program. “Josh was the kid who friended everybody on Facebook beforehand,” recalls his fellow Miller School of Medicine student, Leah [who asked we not use her last name for privacy]. “I had no idea anything was going on with him. He’s also one of the most selfless people I know. He would drop everything to do a favor for anyone.” Case in point: right off the bat, soon after the two moved to Miami, Leah went to town furnishing her apartment and Novy offered to drive her to a local furniture store to pick up a coffee table, and then helped her lug “this 100-pound piece of glass tabletop” inside. Meanwhile, Yvonne Novy-Cutler was calling her son to check in. “Can’t talk. I’m busy. Studying,” he’d tell her, not wanting her to know that he was wincing in pain, or hunched over the toilet every night. “It wasn’t until later that I found he was sick as a dog and had lost thirty pounds,” she says. 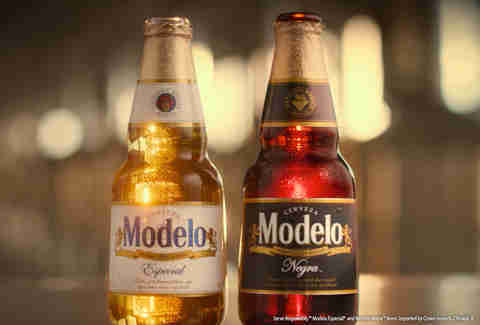 Thrillist partnered with Modelo® to find someone who truly embodied the fighting spirit. So we looked to our readers to nominate someone who has overcome a hardship or who selflessly gives back to their community for a chance for their story to be told on Thrillist. That is how we discovered Joshua Novy. He not only struggles with sickness and hardship, but he uses it to his advantage to help others while always staying positive. So raise a glass of Modelo® to Josh and others like him making the world a better place. Aware that his diagnosis was no longer possible to hide, in October Novy posted a note to his medical school class on Facebook. The news spread like wildfire. To this day, Novy is still caught off guard by how many friends and colleagues care enough to check in and ask him how he’s doing despite their busy hospital rounds and class loads. If the low point of his experience with leukemia hit during October 2014, Novy says the high point came during December of that year when he received news that his first round of treatment was working. This time, he posted a positive update on Facebook and invited his fellow students to a party at Fado, an Irish pub in downtown Miami. The majority of his class showed up to celebrate. And now, there is even more cause for celebration. Novy is responding well to treatment. His symptoms have largely stabilized, with the exception of the occasional flare-up, and his prognosis is good. And by 2018, he should be a full-fledged MD, having tackled cancer and med school simultaneously.